We are happy to announce the DrosEU/ ESEB STN Summer School on Adaptation Genomics, a two-day event to take place on 23-24 August 2018 at the CNRS campus in Montpellier, right after the Evolution 2018 meeting (http://evolutionmontpellier2018.org/). The summer school aims at fostering the study of adaptation genomics and evolutionary genetics in a variety of systems and using diverse approaches (e.g., population genomics, life-history analyses, statistical inference based on population and quantitative genetic theory, landscape genomics, GWAS, and Evolve & Resequence experiments). The school is organized by the European Drosophila Population Genomics Consortium (DrosEU; http://droseu.net/) and sponsored by the European Society for Evolutionary Biology (ESEB) and the Mediterranean Center for the Environment and for Biodiversity (CEMEB). Although DrosEU focuses on Drosophila, the research questions, methodological approaches and the conceptual issues addressed by our consortium apply to many species beyond the Drosophila model. Our two-day mini-summer school will gather approximately 60 people, especially students and postdocs from within and outside the DrosEU community, as well as invited speakers who are leaders in the field. We will have sessions with 6 invited speakers (each with a 1-hr talk, followed by 30 min of discussion) and 6 contributed PhD/postdoc presentations (20 min plus 10 min of discussion). By bringing together empiricists and theoreticians working on different model systems and using different approaches, this meeting will promote fruitful discussions and allow identifying new avenues for the study of the adaptation in natural populations. We look forward to seeing you in Montpellier! The organizing committee: Nicolas Rode [Montpellier], Sara Guirao & Josefa González [Barcelona], Martin Kapun & Thomas Flatt [Fribourg], on behalf of DrosEU. Andrea Betancourt (University of Liverpool, website): Transposable element evolution in Drosophila. Joachim Hermisson (University of Vienna, website): Signals of polygenic selection: between sweeps and small frequency shifts. Juliette de Meaux (University of Cologne, website): Can cis-regulatory variation point to the molecular targets of polygenic selection? Insights from the Arabidopsis genus. Cristina Vieira (University of Lyon, website): (Epi)genomic environmental stress response in Drosophila. Renaud Vitalis (INRA, website): Inferring demographic and adaptive histories from genome-wide polymorphism data. 9:30-11:00 (Epi)genomic environmental stress response in Drosophila. Cristina Vieira (University of Lyon, France). 11:30-13:00 Transposable element evolution in Drosophila. Andrea Betancourt (University of Liverpool, UK). 14:30-16:00 Evolution timescales in Drosophila. Dmitri Petrov (Stanford University, USA). 16:30-17:00 Genetic and plastic response of heat tolerance in Drosophila subobscura. Luis E. Castañeda (Universidad de Chile, Chile). 17:00-17:30 Genomics of an adaptive balanced inversion polymorphism in a seaweed fly. Claire Mérot (Université Laval, Canada). 17:30-18:00 Polygenic adaptation fuels genetic redundancy in Drosophila. Neda Barghi (Institut für Populationsgenetik, Austria). 9:30-11:00 Can cis-regulatory variation point to the molecular targets of polygenic selection? Insights from the Arabidopsis genus. Juliette de Meaux (University of Cologne, Germany). 11:30-12:00 Measuring genetic differentiation from Pool-seq data. Valentin Hivert (INRA UMR CBGP, France). 12:00-12:30 Fine-mapping a quantitative trait locus for local adaptation to cold in Drosophila ananassae. Annabella Königer (LMU, Germany). 12:30-13:00 Demographic inference reveals the molecular consequences of domestication process and outcome in two species of the Solanaceae family (pepper and tomato). Stéphanie Arnoux (INRA, France). 14:30-16.00 Inferring demographic and adaptive histories from genome-wide polymorphism data. Renaud Vitalis (INRA, France). 16:30-18:00 Signals of polygenic selection: between sweeps and small frequency shifts. Joachim Hermisson (University of Vienna, Austria). How can I book my accommodation? For those also attending the Evolution2018 meeting, acommodation can be booked jointly using the Evolution2018 website: http://evolutionmontpellier2018.org/accommodation. We generally recommend hotels that are within a walking distance of the Tram 1 line (see information below). 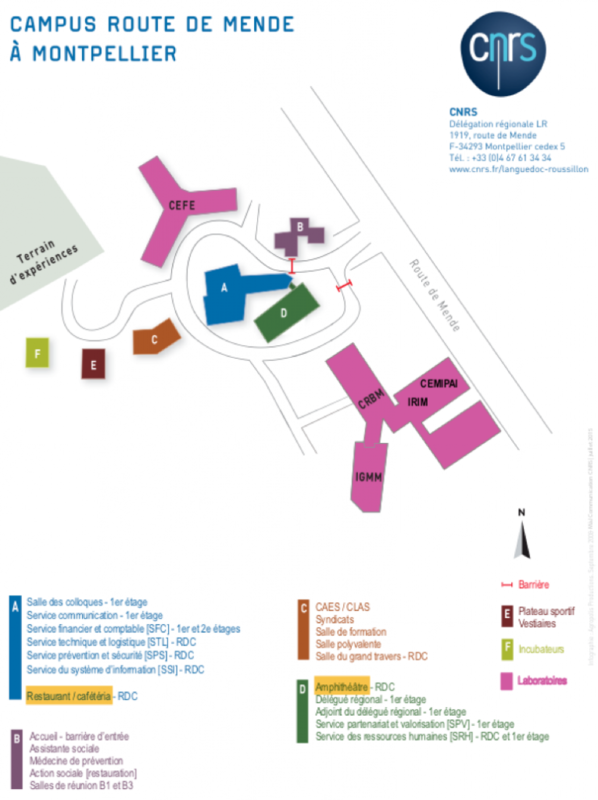 How to get to the CNRS? You can buy tram tickets at each tram stop (Ticket “1 voyage”, 1.60 € on way, use credit card or cash, but please note that the machine does not have change). Tram 1 (blue tram, terminating at “Mosson”) until the tram stop “Saint Eloi”. Take bus 22 (terminating at “Clapier/Jacou”) until the bus stop “CNRS”, the Amphitheatre is on the CNRS campus across the street from the bus stop (bus every 30 minutes). Bus 22 schedule from Saint-Éloi to the CNRS and from the CNRS to Saint-Éloi. Take the bus “La Navette” (terminating at “Agropolis”) until the bus stop “Vert Bois”, walk up the street “Route de Mende” for 400 meters, the Amphitheatre is on the CNRS campus on the left hand side of the street (bus every 10 minutes). Bus “La Navette” schedule from Saint-Éloi to Vert-Bois and from Vert-Bois to Saint Éloi. For your precise itinerary please consult the TAM website (in French) using the following address: 1919 route de Mende.